How many times have you seen a person on the news who has been taken advantage of by lottery scams and scammers? You have most likely seen it at least once and, as the scammers get better at better at their techniques, those occurrences are escalating. It might be difficult to contain your excitement if you receive an email that claims that you have millions of dollars in an overseas bank account with your name on it and all you have to do is pay a one-time transfer fee, but you need to try. Why? Because an ounce of prevention is worth a pound of cure. Before you start spending your money, the first thing ask yourself is if you have entered a lottery. If not, chances are this is a bogus deal. Check the email address. Is this a legitimate company? If it is from a Yahoo or Gmail account, in all probability this is not a genuine win. Type in everything that follows the @ symbol and see what comes up. You will be surprised by what you find. Are they asking you for money? Authentic lotteries do not ask for cash. Check the spelling. This is a little thing, but can save you a lot of heartache. Legitimate lottery companies have the money to hire literate employees. If your winning notification contains a lot of misspellings and grammatical errors, it is probably bogus. Are they asking for your personal banking accounts? Checking or savings, debit or credit cards? If so, this is almost certainly a scam to try and steal your money. And last but not least, if you have done all of the above and you are still not sure, then use Google to do a search. Most scams can be found somewhere on the internet and are easily accessible with a few clicks of the mouse. In addition to the above mentioned tips, there are other ways to protect yourself as well. Resist sharing your email address, when possible. Do not follow links provided in any emails you might receive. Viruses and other malware could be present and cost you hundreds of dollars in computer repair. 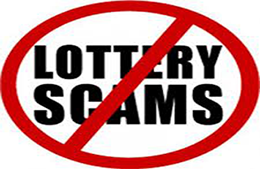 Report possible scams to local authorities, who can then distribute a warning to the proper source, and hopefully alert other citizens of a possible lottery scam.